Meal times in a large family could be a bit of a challenge - it was hard to please everyone. Something that we all seemed to like were curried sausages. Easy to make, inexpensive and bulked out with lots of mash potatoes and veg they appeared on the menu fairly often. My recollection of them was of boiled sausages that were cut up and put into a gravy that was flavoured with curry powder. This very simple curry was the starting point of my interest in and liking for curry. 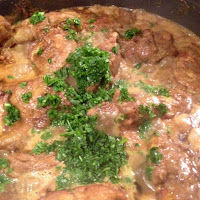 Over the years the idea has been adapted, sausages are not used and additional ingredients added, however, the basic concept has remained - meat in a curry flavoured sauce. 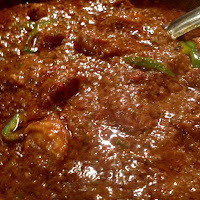 I like to use a good quality Indian curry powder, onions and garlic are essential and coconut cream or tinned tomatoes will make a good gravy. 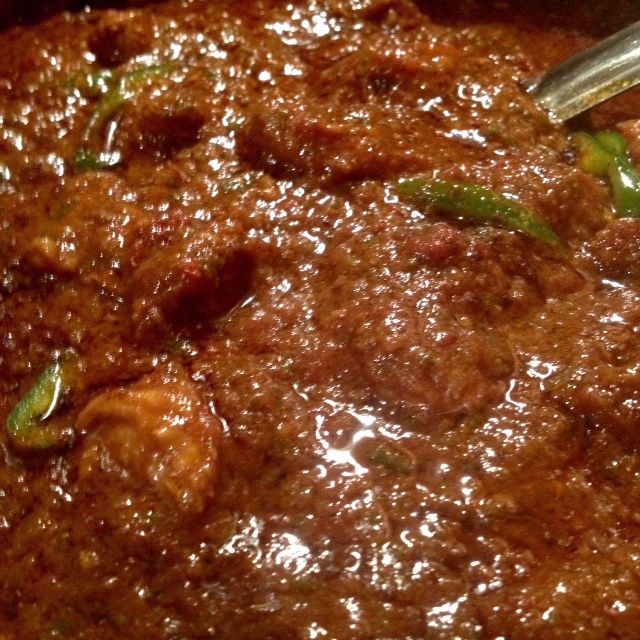 A longer and slow cooking process is best as the sauce develops a rich mellow flavour. Other ingredients have been listed in the recipe and add immensely to the depth of flavour, however, the curry will still be tasty without them. My cooking life is simplified and the shopping time reduced by keeping supplies in the freezer. As with all curries this keeps well, can be frozen and is best made in advance. 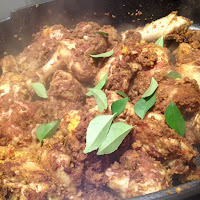 Use making a meat curry use large pieces of meat and if possible add the bones into the cooking curry and remove before serving. 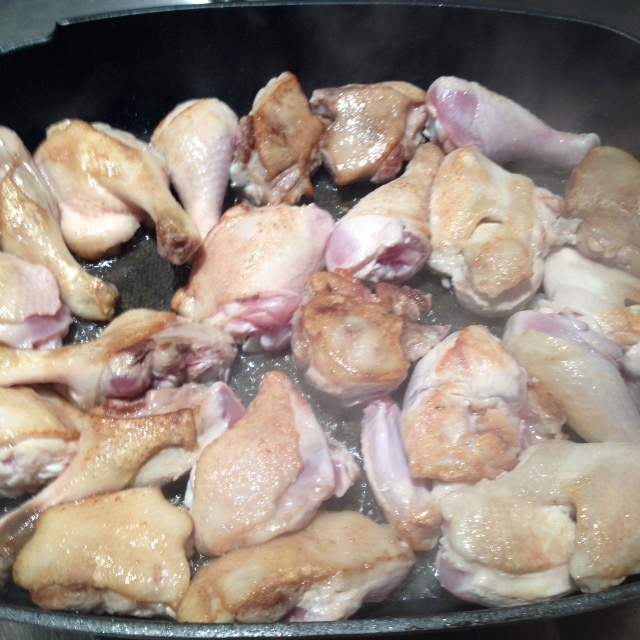 For duck and chicken curries use drumsticks, thighs or jointed marylands. Meat curry, this one is made with pork, however, lamb and beef could be substituted. The sauce has tinned tomatoes instead of coconut cream. 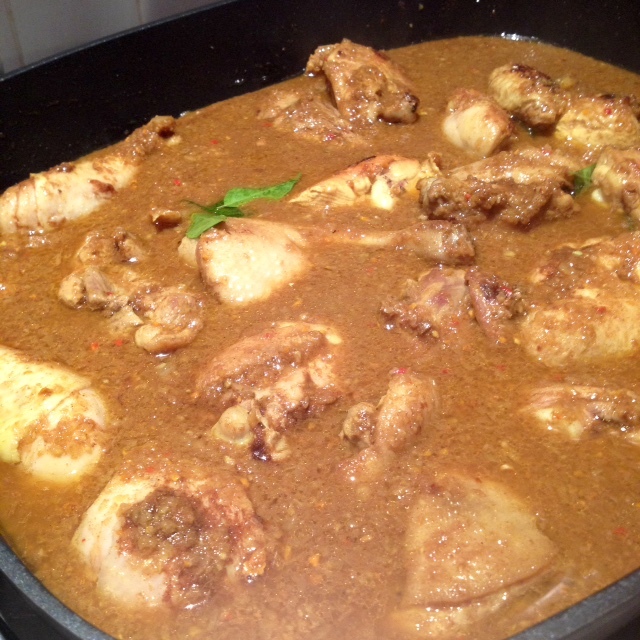 While duck/chicken/pork/meat is browning make a paste of the onions, garlic, coriander, ginger, turmeric and chilli. 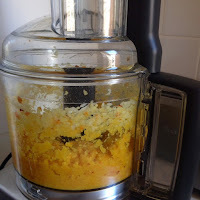 I use a food processor to do this; however, it can be done by finely chopping the onion and using a mortar and pestle or by grating the ginger and turmeric, crushing the garlic. Add paste ingredients and cook for a minute or so, stirring to prevent the paste from burning, then add curry powder and fenugreek powder. Cook a further minute. Add curry leaves and enough stock or water to cover. ** I use whole ducks and chickens that I bone out so that I can use the breast meat for another dish and the bones for stock, however, pieces can be purchased. Ingredients marked* are optional but add to the flavour. To simplify shopping I purchase fresh curry leaves and then freeze them. Green ginger and fresh turmeric can also be frozen and then grated and used frozen. Joint each of the duck and chicken marylands into two pieces. 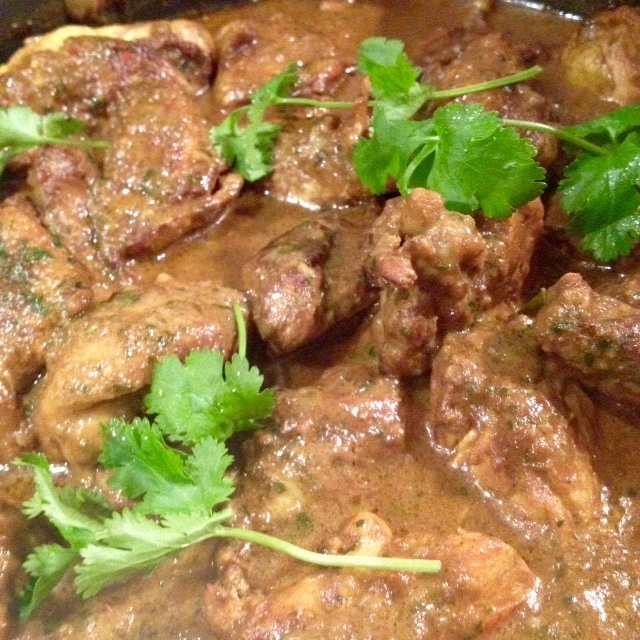 While duck/chicken is browning make a paste of the onions, garlic, coriander, ginger, turmeric and chilli. I use a food processor to do this; however, it can be done by finely chopping the onion and using a mortar and pestle or by grating the ginger and turmeric, crushing the garlic. 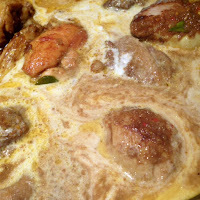 Add paste ingredients to duck/chicken and cook for a minute or so, stirring to prevent the paste from burning, then add curry powder and fenugreek powder. Cook a further minute. Cover and cook on a low heat or in 150 deg C oven for an hour or so. Add coconut cream and chopped coriander and cook a further thirty minutes or until meat is tender. Check the flavour and add additional chilli and salt if necessary. While pork is browning make a paste of the onions, garlic, coriander, ginger, turmeric and chilli. 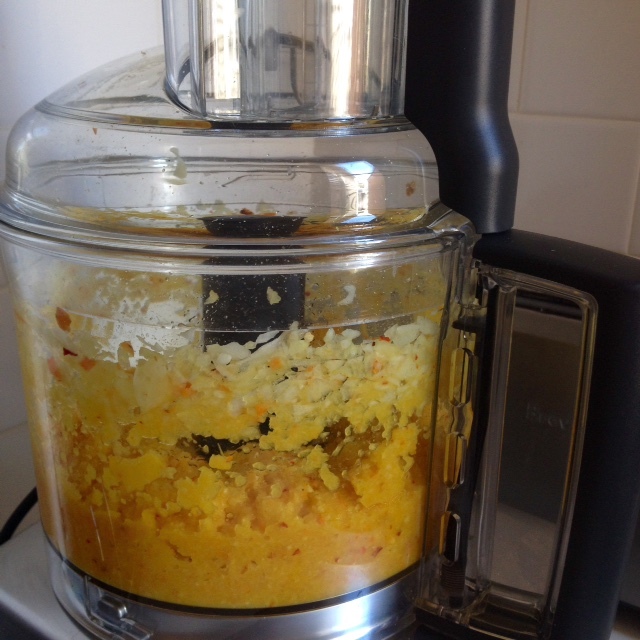 I use a food processor to do this; however, it can be done by finely chopping the onion and using a mortar and pestle or by grating the ginger and turmeric, crushing the garlic. Add paste ingredients to pork and cook for a minute or so, stirring to prevent the paste from burning, then add curry powder and fenugreek powder. Cook a further minute. Add curry leaves and enough stock or water to cover the meat. Cover and cook on a low heat or in 150 deg C oven for an hour or so. Add tinned tomatoes and chopped coriander and cook a further thirty minutes or until meat is tender. Check the flavour and add green chilli if desired and salt if necessary.